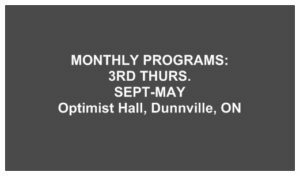 Thursday, October 21st, 2010 at 6:00 p.m.
MEETING OPENED BY PRESIDENT JUDY JEFFERY WITH A WARM WELCOME TO 53 MEMBERS AND ALSO THE TRILLIUM WINNERS. THANKS TO LINDA MULDOON WITH HELPER JIM McHANEY AND MARY McKINNEY , IN CHARGE OF SELLING 50/50 TICKETS AT COST OF $2.00 EACH, 3 FOR $5.00 AND 7 FOR $10.00 BETTY BALLANGER IS IN CHARGE OF WAYS AND MEANS SELLING TICKETS AT 3 FOR $ 1.00 ON NUMEROUS BULBS, ORCHID PLANTS AND OTHER ITEMS AND GWEN VAN NATTER FOR HELPING TO SELL OUR SPRING BULBS, T-SHIRTS AND APRONS. “ BIRD SIPPERS” WHERE ALSO DISPLAYED AND CAN BE USED TO PUT BIRD SEED IN A TEA CUP AND WATER IN THE SAUCER WITH A SILVER SPOON ON A LONG STAND THAT CAN BE ANCHORED IN THE GARDEN. IF INTERESTED CONTACT PRESIDENT JUDY JEFFERY. PRESIDENT JUDY JEFFERY INTRODUCED THE HEAD TABLE; SPEAKER DENNIS FALLAT FROM VAN NORT BULBS, DISTRICT 9 DIRECTOR MARVIN MEHYRE AND HIS WIFE HELEN, SECRETARY DORIS THOMSON, TREASURER KIM CHRISTOFF AND MAYOR MARIE TRAINER. IAN STEEL PLAYED O’CANADA AND ALL WHERE ASKED TO STAND AND SING ALONG. GRACE WAS GIVEN BY GEOFF JOHNSTON. WE ALL ENJOYED A FABULOUS MEAL OF MANY ASSORTED HOT AND COLD ITEMS AND LOVELY DESSERTS. IT IS JUST AMAZING TO SEE ALL OF THE DIFFERENT MEALS PREPARED AND THE VAST ASSORTMENT OF SO MANY DIFFERENT THINGS. PRESIDENT JUDY JEFFERY EXPRESSED HER THANKS TO THE DIRECTORS AND OFFICERS FOR ALL THEIR WORK IN ORGANIZING THE POT LUCK SUPPER THANK YOU TO PAT TAYLOR VAN NATTER AND KIM CHRISTOFF FOR THE NUMEROUS CENTERPIECES ON THE TABLES WITH A LOVELY COLOR FALL THEME. SPECIAL THANKS TO DON DAVIS WHO GREETED PEOPLE AT THE DOOR WITH LUNA, HIS GREEN WINGED MACAW PARROT WHO JUST LOVES TO SOCIALIZE WITH EVERYONE. WHAT A BEAUTY SHE IS! PRESIDENT JUDY JEFFERY INTRODUCED OUR SPEAKER DENNIS FALLAT FROM VAN NORT BULBS. QUESTION AND ANSWER TOPIC’S, FOLLOWED BY SCREEN PRESENTATION OF LOVELY FLOWERS AND MANY BITS OF ADVICE. THANK YOU WAS EXPESSED TO DENNIS FALLAT FOR HIS VERY INTERESTING KNOWLEDGE AND ALSO FOR THE MANY PACKAGES OF SPRING BULBS THAT HE DONATED. DRAW WAS THEN HELD FOR THE BULBS AND CENTERPIECES ON THE TABLES AND WHERE GIVEN TO ANYONE HAVING THE CLOSEST BIRTHDAY . THE DRAW WAS HELD FOR THE 50/50 AND THE WINNER, WON $97.00 DRAWS WHERE THEN HELD BY BETTY BALLANGER FOR THE WAYS AND MEANS.